Autumn Burger – from the new cookbook by Sophia DeSantis, Vegan Burgers and Burritos. 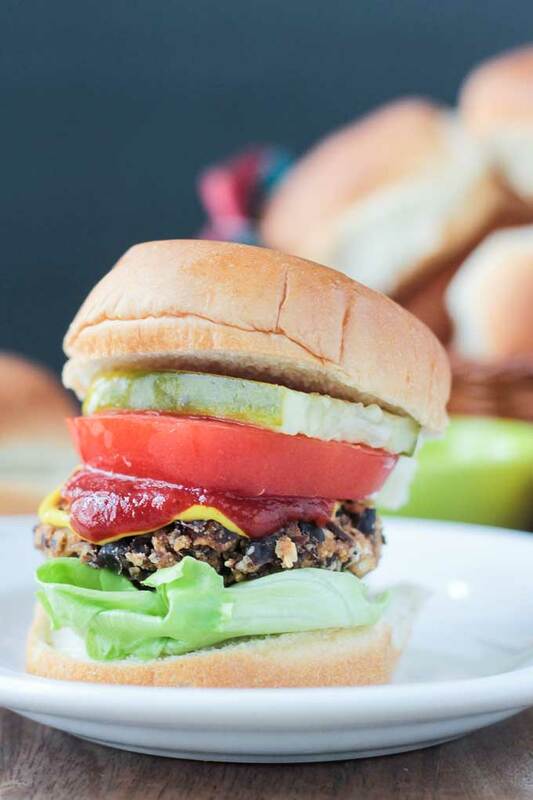 This vegan burger is made from all whole food ingredients and so full of flavor. 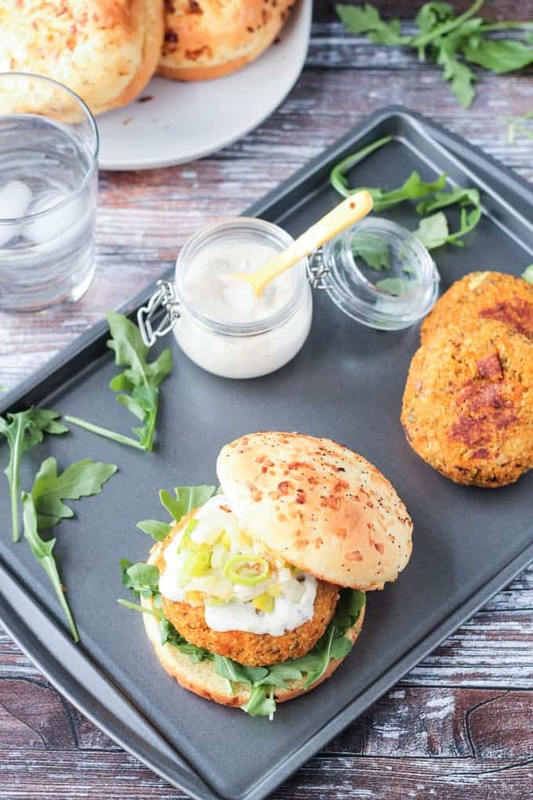 Accompanied by an amazing healthy vegan mayo, these burgers will make your entire family happy! It’s never been easier for vegans and those following a plant based diet to find easy delicious recipes. There are so many awesome vegan cookbooks out there right now. And I’m proud to say that a number of them are written by friends of mine. The latest and greatest that I’ve gotten my hands on is Vegan Burgers and Burritos: Easy and Delicious Whole Food Recipes for the Everyday Cook by the lovely Sophia DeSantis. Keep reading for a complete review of this new book, the recipes for her flavorful Autumn Burger and totally legit Healthy Vegan Mayo, and a GIVEAWAY! Sophia is the fun loving voice, recipe developer, and photographer behind the popular blog, Veggies Don’t Bite. Her philosophy on diet, and life in general, aligns closely to my own – balance. I’ve been enjoying her recipes for years. She’s the queen of all things burger, burrito, and especially…sauce! You might remember her BBQ Tahini Sauce being the inspiration for my BBQ Kidney Bean & Kale Burger. I was lucky enough to have met Sophia several years ago when I was in California for a conference. She was so easy to talk to and we chatted and laughed for hours while noshing on yummy vegan eats and lots of wine. Good times! That’s Sophia in the photo above with her adorable family – clearly all of them just as fun as she is. So which team are you on? 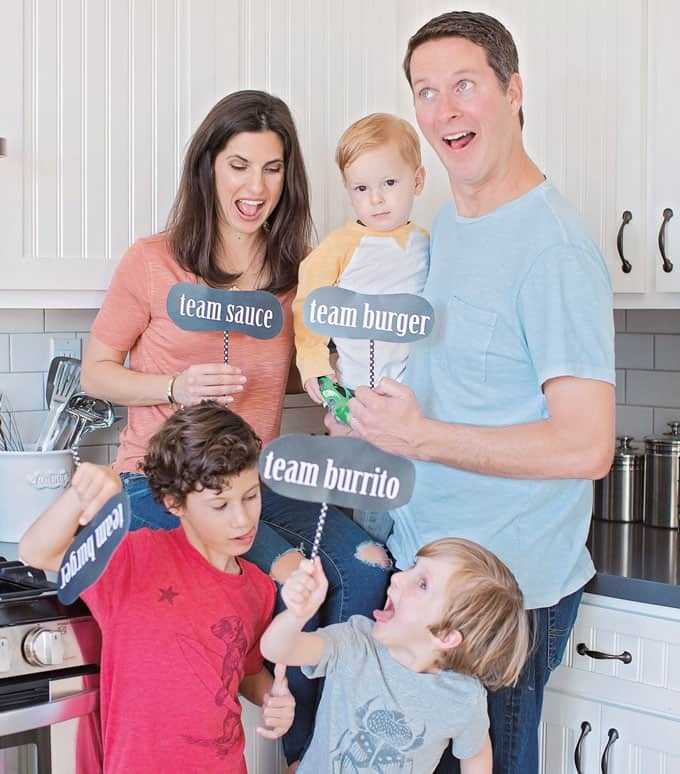 I’d have to go with #teamsauce myself – the sauce makes the meal! 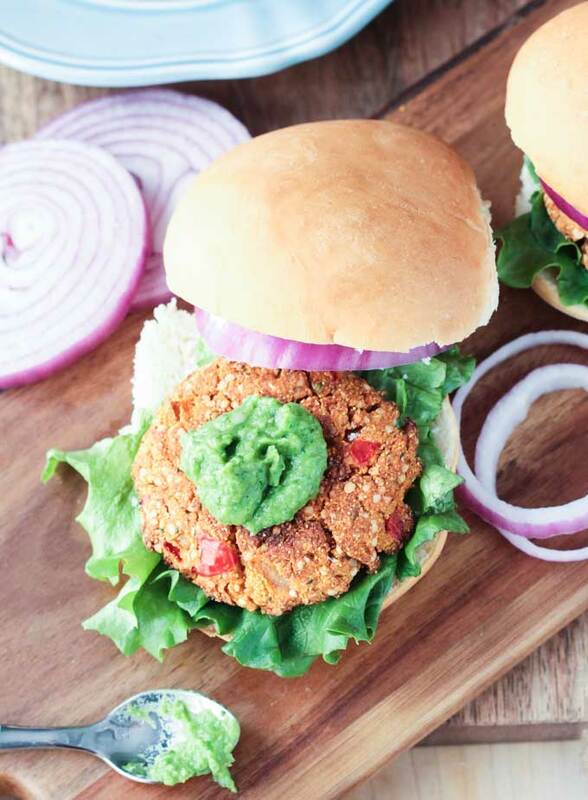 This cookbook is all about vegan burger and burrito recipes if you haven’t yet guessed. 27 Burgers and 26 Burritos to be exact. But you’ll also find 19 Sauces and 4 Sides! All of which are made from whole plant based foods, gluten free, and refined sugar free. Here’s a sneak peak of just a few to get your mouth watering. 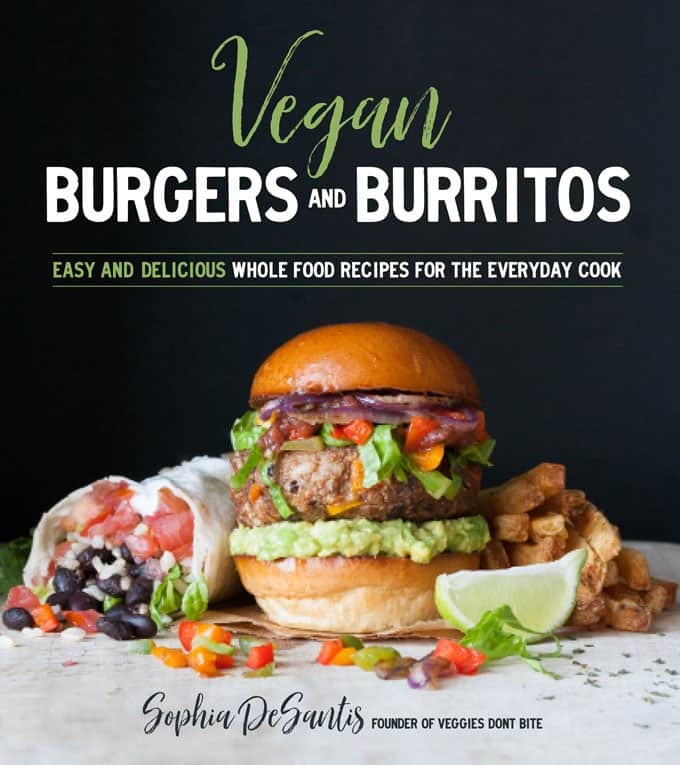 All of the vegan burger and burrito recipes in this book are accompanied by a sauce pairing. The Autumn Burger I made gets paired up with Sophia’s Healthy Vegan Mayo, WHAT? (<- I love the creative titles she uses throughout this book). This mayo is legit, guys! The consistency is exactly like traditional mayo, yet tastes even better. She adds a little extra lemon juice and thyme to the original recipe to pair it with the Autumn Burger and it’s divine! Speaking of perfect consistency – this fall inspired vegan burger is spot on! Super flavorful and moist, yet firm and sturdy. The outside has a nice crunch. No mushy squishy burgers here! 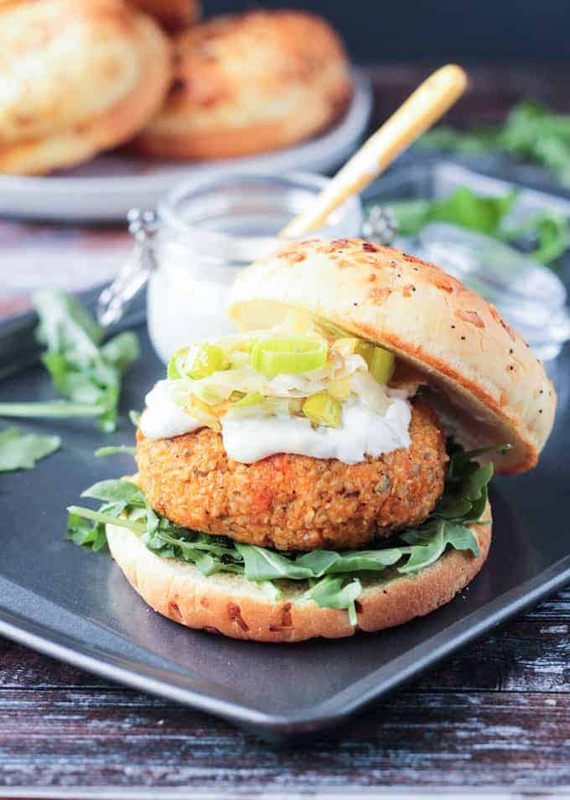 Topped off with Sophia’s healthy vegan thyme mayo and some extra sautéed leeks – you’ll find yourself going back for seconds even on a full belly! My hubby especially liked these burgers and he’s a hard one to win over as far as veggie burgers go. I hope you love this vegan Autumn Burger as much as we do! And don’t forget to enter the giveaway below for your chance to win a copy of Vegan Burgers and Burritos for yourself! From sweet butternut squash to thyme and sea salt, the fall flavor intensity here has a “go big or go home” attitude. A little extra effort is truly worth it because these little patties are insanely delicious! In a large mixing bowl, mix the squash with 5 tablespoons (74 ml) of broth or a drizzle of oil and 1 teaspoon of salt. Place the squash on a parchment-lined cookie sheet and roast for 15 minutes. Meanwhile, place the apples, leeks, garlic and thyme in the bowl and mix well with the other 3 tablespoons (45 ml) of broth or a drizzle of oil. Add this mixture to the cookie sheet with the roasted squash, mix around to incorporate and roast for 30 minutes. While the vegetable mixture is roasting, place the rice, pumpkin seeds and the remaining 1 teaspoon of salt into a food processor. Pulse until chopped well. 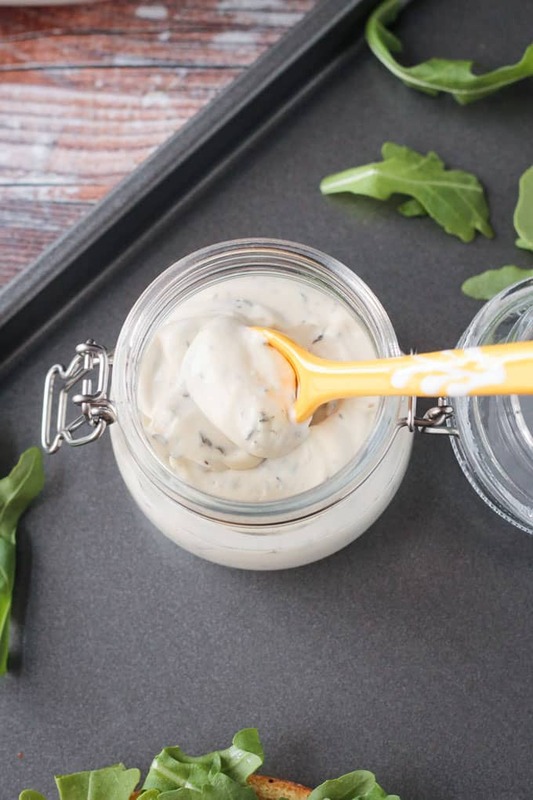 To make the Lemon Thyme Mayo, combine Healthy Vegan Mayo, WHAT? (instructions below), lemon juice and thyme in a small bowl and mix well. Set aside for serving. Once the veggie mix is done roasting, allow it to cool a few minutes, then add the mix to the processor and pulse only a few times to incorporate. Don’t overpulse. To cook, shape the mixture into patties. If you’re not using a nonstick pan, then you may want to prepare the pan by brushing it with a tad of oil to avoid sticking. Place the patties in a pan on the stovetop over medium heat for 15 minutes on each side. Pans and stovetops vary, so begin to check the patties at 10 minutes. If you try to slide your spatula under a patty and it won’t give, then it isn’t ready and needs to cook longer. You can also bake the patties on a parchment-lined cookie sheet at 375F (191C) for about 20 to 25 minutes on each side. Allow the patties to cool and set for 5 to 7 minutes. Serve on buns with the Lemon Thyme Mayo and toppings of your choice. Put the cashews, water, vinegar, lemon juice, salt, mustard seed, and garlic into a high-speed blender and purée until smooth. Refrigerate the mayo to thicken. ~Kids: Make patties into a smaller slider size or into nuggets. Serve mayo on the side as a dipper. ~For the Healthy Vegan Mayo, WHAT? : If you are not using a high-speed blender, there are a couple of options for making your sauce smooth: You can use a coffee grinder to grind everything to a fine powder, or make sure to soak your cashews overnight, or for at least 2 to 3 hours. If you forget, you can also boil them for 30 minutes. ~Nutrition facts calculated for burgers alone, not including buns or condiments. Here’s your chance to win a copy of Vegan Burgers and Burritos for yourself. If you just can’t wait to see if you win, and who could blame you, you can ensure you get your hands on a copy by ordering here. Good luck! #TeamBurger for sure! I have eaten a ton of veggie vurgwe brands but want to try to make them myself, healthier with no preservatives! Homemade veggie burgers are so good! You’ll love them, Kelly! I have to go with teamsauce. I’m going to be making that vegan mayo pronto! Excellent! Hope you love it! I’m with you! Great choice! I will have to go with #teamburrito! I love all things mexican, although burgers would be a close second! Me too! Mexican is my fave! #teamburger, #teamburrito, or #teamsauce ? I am #teamall! Hard to decide but I think I’ll go with team sauce. Thanks for sharing this recipe. It looks and sounds great so I will definitely be giving it a try. Team Sauce Rules! Enjoy, Michele! I’m a member of teamburger! Team sauce without a doubt! Yay, another for Team Sauce! Oh yes! I haven’t tried it yet, but it looks amazing! An epic dessert! This looks delicious! I am always down for a good veggie burger but would have to say #teamsauce! I love finding yummy vegan sauces/dips etc. Yay, team sauce! You would LOVE this book, Jenn! Team sauce! Thanks so much for the giveaway. The Autumn Burger looks so good! I never thought of putting apples in a burger even though I often use applesauce in baked goods… I’m a #teamburrito fan, but I’m always looking for a good burger or sauce, too! The flavor combo is so good! Hard to decide, but I choose team sauce. A good sauce can take anything to the next level. I have to try that mayo. Yes, I totally agree!! Enjoy, Loraa! Thank you, Katie! I hope you love them both! team sauce for sure. A great sauce enhances any meal! Yes!! Gotta have a good sauce! Good luck, Nancy! It can be hard to choose but burgers are easier to make at home and I’m more apt to order a burrito when I eat out. That’s a good team to be on! 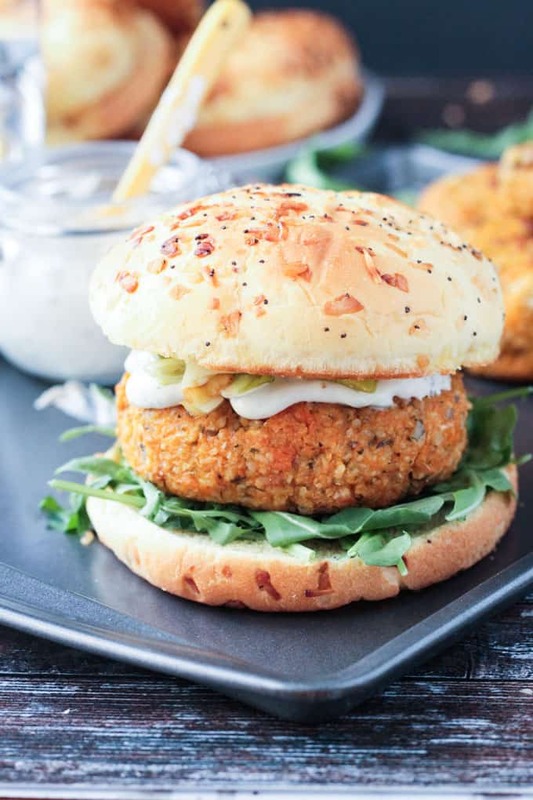 Mmmm we love veggie burgers year round and this one looks fantastic! 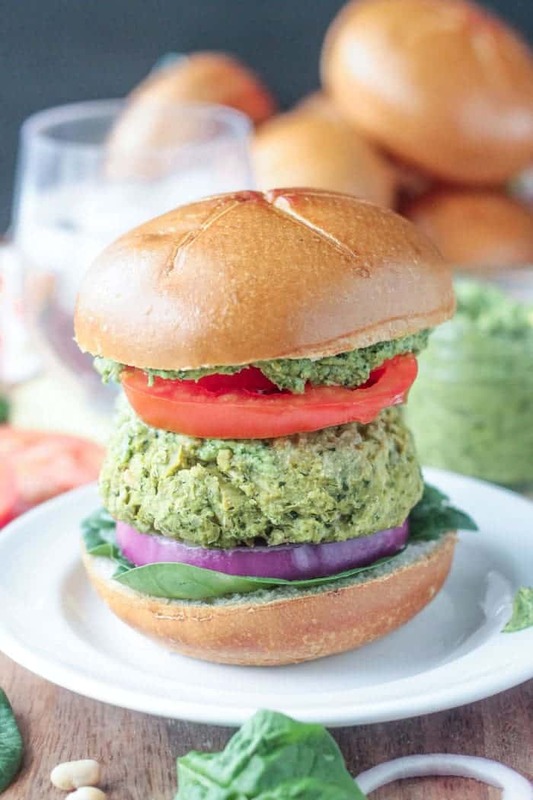 Still searching for a great veggie burger… maybe your book will be my pot o’ gold ! I can’t take credit for the book. Sophia DeSantis is the author. I’m just the middle man bringing you the deliciousness today. But, I definitely think you will love this burger — and all of her others too! That’s a tough choice! #teamburrito followed closely by #teamburger! How’s that? 😉 I’m absolutely making these Autumn Burgers as I have a few butternut squashes to use up. Thanks for the recipe! Oh, yes, that’s just fine! #teamalloftheabove! 🙂 Enjoy, Julie! Let me know how they turn out! Yes! #teamburrito and #teamburger. I will eat them all! Thanks for the chance. Yay! We don’t discriminate over here either. Bring on all of them! I’m looking forward to trying this burger and healthy mayo. It looks fantastic! Looks great. Do you have a knife recommendation for cutting butternut squash? Thanks. Hi, Colleen. I use my big chef’s knife (I have J.A. Henckels brand) as I’m comfortable with it. A medium size would work just fine too. Just make sure it’s sharp so the knife does the work and you don’t have to press too hard (which is when accidents tend to happen). You could also use a peeler. A little harder than peeling a potato, but it works. a burger person myself. That autumn one looks fantastic – i like of the idea of including apple with the beans. It’s such a great combo of flavors! You really can’t go wrong, right?! Thanks, Kim! All these recipes look fantastic. Making the Autumn burgers tonight! Excellent! Be sure to come back and let me know how you liked them. Team burrito! Especially a banana split version! Thanks for the give away! And wait til you see that Banana Split Burriot – epic! Good luck, Meg! Wow that looks fabulous. I work as a cook at a home for teenage girls and cannot wait to try it for them and see how they like it. Trying switch them to more veggie based meals and get them off all the dairy and meat. So excited to see the responses. Oh, I can’t wait to hear! Please report back what everything thinks! Thanks, Talia! This book looks great. Team burrito all the way!